That’s the name I have given my munich malt IPA (still working on the label). This brew has turned out to be quite a fantastic, balanced IPA. It has the necessary hop bite, tons of hop flavor and a dreamy aroma. It does not have the harshness and finess of a sledgehammer that so many IPA’s do. This could be the beer to turn me to the hop side. So really, how is the beer? Well, I will try to give it the good old ratebeer analysis. 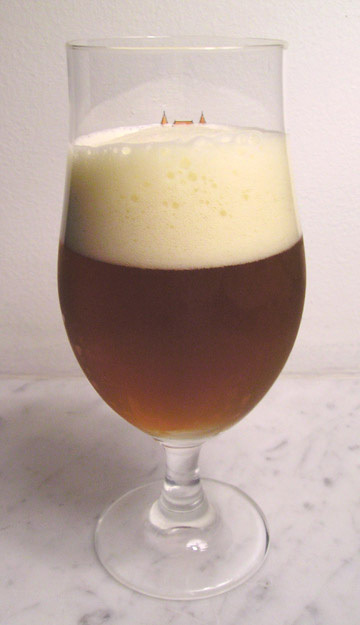 The beer pours a hazy deep copper with orange edges. A tall slowly fading creamy yellowed head sits proudly on top. Pungent hop nose with grapefruit zest and some musty pine resin. Some indeterminate fruitiness blows in as the hops dance around. Very complex hop notes that are a bit hard to nail down. Heavenly if you like the smell of hops! I can pick up something that you could describe as “winey.” Could this be the famed character of the Nelson Sauvin hops or am I just looking too hard for it? No, as it warms up that character comes out more. A touch of simple sugar and malt make their way upfront after a while, but the nose is definitely hop forward. First impression in the mouth is a good stiff bitterness coming from deep with some grassy notes. Not astringent at all but definitely assertive. Some malt and thinned out caramel try to work there way upfront but are pushed back by waves of citrus hops. Some pine is noticed in the throat. Good lightly fruity tones. Quite nice. Malt does finally make its way forward and join the grapefruit and “wine” for a decently long finish. Medium to light mouthfeel with a dry finish. CO2 level is just right. This is pretty much exactly what I was shooting for. The only thing that I would like to change is that the beer is just a touch too thin. That is not really surprising since this was an experiment with only munich malt… nothing to build mouthfeel. I have already adjusted the recipe in BeerAlchemy to include a touch of crystal. It will definitely be brewed again. I am also now in love with Nelson Sauvin hops! 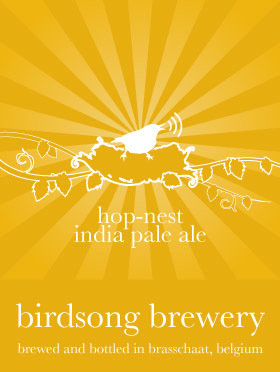 this looks really nice – and yeah, Nelson Sauvin are a really interesting hop.